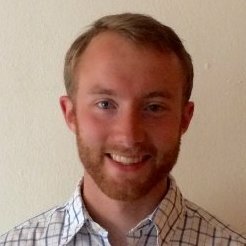 2013 intern David Watkins' internship project focused on exploring controls on the periodicity of episodic slow earthquakes along-strike in subduction zones. During the summer David received guidance from his mentors at Miami University of Ohio; Harmony Collela and Mike Brudzinski. David's summer's work concluded with a poster at the 2013 Fall AGU meeting. After AGU, David continued to pursue the project with his mentors while completing his senior academic year. The effort certainly has paid off and we congratulate David and his mentors on the recent publication of this work. Watkins, W. David, Colella, Harmony V., Brudzinski, Michael R., Richards-Dinger, Keith B., and Dieterich, James H. (2015) The role of effective normal stress, frictional properties, and convergence rates in characteristics of simulated slow slip events. Geophysical Research Letters. 42(4) , doi:10.1002/2014GL062794. Currently, David is working on a masters degree at the University of Wisconsin-Madison with Cliff Thurber and Chuck DeMets. There he is studying the Rivera Subduction Zone in western Mexico with seismic tomography.